When you get invited to many a product launch or special event or opening, being part of the media can be pretty sweet. 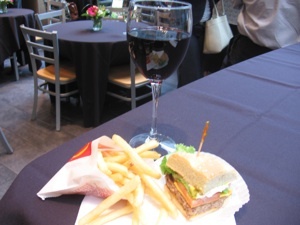 Just picture the event I was at last night: Have a glass of wine, listen to the nice jazz combo...and sink your teeth into the new Angus Third Pounder, McDonald's first new burger since the Big N' Tasty came on the scene in 2001. Yep, these new burgers are a big deal to McDonald's, so they had a nice little shindig at the 23 S. Clark St. location to celebrate the addition to the menu. I got to sample all three versions of the new burger, meet the chef behind the product, and rub elbows with Ronald McDonald. 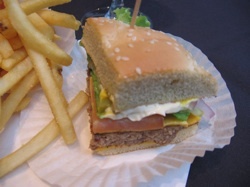 The burgers, which will be on menus for the next several months, are made of 1/3 pound of Angus beef and utilize ingredients that have never been on a McDonald's burger before, such as rings of red onions, crinkle cut pickles, bakery-style sesame seed rolls, mushrooms, and Swiss cheese. The burger comes in three versions: the Deluxe (mayo, mustard, tomato, red onion, pickles, and two slices of American cheese), the Bacon & Cheese (ketchup, mustard, red onion, pickles, three slices of bacon, and two slices of American cheese), and the Mushroom & Swiss (mayo, sauteed mushrooms, and two slices of Swiss cheese). Chef Dan Coudreaut, a classically trained chef who works in the Discovery portion of McDonald's test kitchens, is one of the brains behind this product. Coudreaut, who's been with the company since 2004, also brought you the Snack Wrap, the Asian and Southwestern Salads, and the McSkillet Burrito, among other products. After operators in California suggested the idea of a premium burger, Coudreaut and his team worked to come up with the best burger possible. "The quality of the Angus burger is what we're all about--what I'm all about," he said. The creation of this new burger started in 2007. 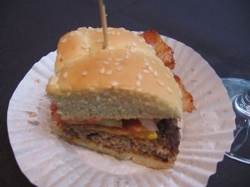 The team came up with 25 versions of the burger, and through a lengthy process that involved executives in leadership, supply chain and operations to make sure the product could be made affordably, followed by extensive test marketing, they whittled it down to these three. Coudreaut said that after this initial nationwide run, the president of the company would decide whether or not to make the burger a permanent addition to the menu. Rodney Lubeznik, owner of this particular restaurant (and others in Chicago and Northwest Indiana), said, "We're very excited about the Angus burger." He explained that a lot of quality ingredients went into the product, that even the tomato slices were thicker than ones they normally used. "We will be able to offer new flavors and options to our customers," he said. OK, so it's nice to have a new flavor option, but how do these stack up? On Tuesday I had a Quarter Pounder with Cheese to get the flavor in my head and see how the new burgers would compare. First up was the Deluxe. To be quite honest, I didn't notice a whole lot that was different. Yes, the burger patty was a bit thicker, and the red onions stood out. I could tell that the pickles were a little more noticeable--a little crunchier than the usual McDonald's pickle. And the red onions added a sharper flavor than the standard onions. But overall? It wasn't much to write home about. Next I tried the Mushroom & Swiss. Here I could tell the difference in the flavor of the meat. Although your basic Quarter Pounder can really hit the spot, the Angus meat to me has more flavor to it and is a bit heartier, and you could taste it here. 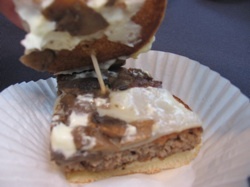 I also dug the mushroom and Swiss combo on the toppings--it paired nicely with the Angus. My only complaint was the mayo. Oh, taste-wise it was pretty good, but I'm in the camp where a little mayo goes a long way, and if the balance of mayo to swiss and mushrooms is heavy on the mayo, you start losing the mushroom flavor. Finally, I had the Bacon & Cheese. It has bacon. How could you go wrong? Seriously though, the bacon was plentiful, and it was nice and crispy. The bacon and Angus flavors complemented each other well, and you could taste the difference on the pickles and onions compare to McDonald's other burgers. This one was a real All-American burger. How do they compare on price? At this location, a Quarter Pounder with Cheese is $3.30. The Double Quarter Pounder with Cheese is $4.10. A Big Mac is $3.40. The Angus Third Pounder comes in at $3.99. Worth it? Yeah. You're getting a little more for your money--more meat, some really nice toppings, and I think it justifies the price difference. Overall, I'd say McDonald's should do well with this trio. For people who are tired of the same old fast food burgers, this gives them something really different to try. If you have a big stomach, the extra meat will fill you up. If you're not a big eater, you may not be able to finish the entire thing (I ate three-quarters of a sandwich and a small fry, and that was plenty for me). Still, if you find yourself at a McDonald's, give the Angus Third Pounder a try. You might be pleasantly surprised. McDonald's is food, and is a Chicagoland company. Therefore, it falls under the purview of a Chicago food blog. What was your question? 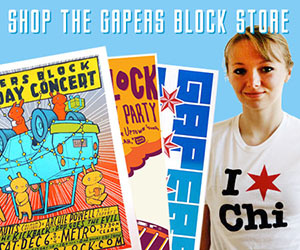 There are plenty of Chicagoland companies that sell burgers that are not written about on Gaper's Block. The wtf question above is very appropriate. 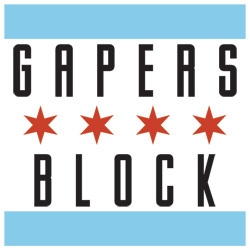 Why Gaper's Block would make an editorial decision to publicize a company that puts out a low-quality, unhealthy product while engaging in abysmal labor practices actually deserves much more than a wtf from readers, it deserves an apology to readers.